Screened Cable from the VFD to the Motor. A screened cable is used betwen the output of the VFD and the motor because, provided that it is corectly terminated, it will reduce the return impedance for the noise coupled into the motor frame by a factor of 20 - greater than 100 and this in turn will reduce the motor frame noise voltage proportionaly. Recent tests done with a VFD connected to a motor showed that where a screened cable, glanded into the VFD and the motor with EMC glands, was used, the motor frame voltage was 0.82V pk-pk and where the same motor was used with a four core cable unscreened, the motor frame voltage was 96V pk-pk. 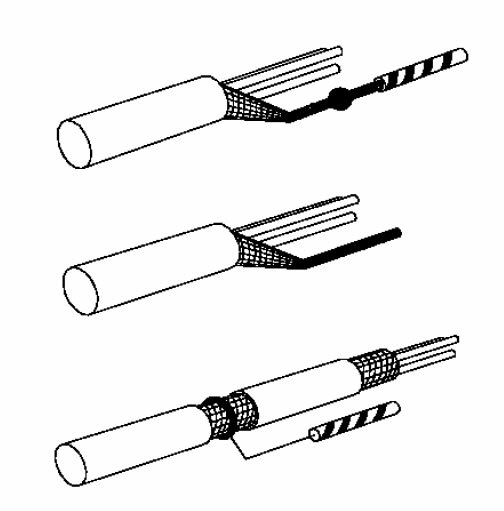 There are a number of ways of terminating the screen of the screened cable, but only some are useful in minimising the noise produced in the frame of the motor. It is important that the screen is bonded around the full 360 degrees of it's surface either by the use of an EMC screened gland, or by a clamp mechanism such as a saddle clamp. The use of pigtails is one of the best ways to defeat the use of the screened cable. The pigtail length refers to the total length of pigtails between the VFD and the motor. Two pigtails, one at the motor and one at the VFD, each with a length of 50mm give a total length of 100mm and an increase in EMC noise voltage in this installation of more that eight fold. 500mm of pigtail length, and the screen is only halving the EMC noise!! There are two major techniques of terminating the screen on a screened cable. One way is to clamp around the exposed screen and cable providing a 360 degree connection to the screen using a metalic clamp or an EMC screened gland. This provides a large surface area connection to the earth or chassis of the equipment. The alternative is to terminate the screen to a standard circular cable and connect this to a ground or chassis connection. This can also be achieved by peeling the screen off the cable and twisting it together and sleeving it to make it into a standard conductor. The smaller conductor is known as a pigtail connection and has a much lower surface area than the screen and so exhibits a much higher impedance at the high frequency than the screen.